The Church of England faces fresh division at its synod over proposals to ordain women as bishops and to end the job for life given to most vicars. There will also be further debate about the Church's split over homosexuality. The Archbishop of Canterbury has blocked attempts by conservative evangelicals to have a debate about Prince Charles' forthcoming marriage. He also issued a statement confirming that the marriage was within Church guidelines and had his 'full support'. 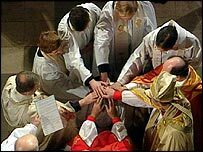 Women were first ordained as priests in the Church of England 10 years ago. BBC correspondent Robert Pigott said they were becoming increasingly impatient at what they claim is the Church's discrimination in denying them a role as bishops. But some members feared overturning the long history of male-only bishops could further divide a church already weakened by its dispute over homosexuality, our correspondent said. The synod faces another rift over plans to end the ownership of the freehold of their churches and vicarages, enjoyed by most clergy. The ownership effectively gives them a job for life. Other priests have very little job security and a universal system of employment contracts is planned. Meanwhile, the Archbishop of Canterbury Rowan Williams has denied calls by some synod members for a debate about the marriage of Charles and Mrs Parker Bowles. Their concerns stem from Charles' presumed future role as supreme governor of the Church of England, one of the monarch's traditional titles. Some synod members believe the marriage will leave Charles unfit to head the church. Dr Williams' blocking of a debate would not stop the issue dominating discussion outside the chamber, our correspondent added. Rev David Phillips, director of the Church Society, a conservative, evangelical group in the Church, told BBC News: "I don't believe he should be remarrying and if he's determined to go ahead he shouldn't be in a position where he can become Supreme Governor of the Church of England." But Reverend Prebendary David Houlding, a member of the Archbishop's Council, said any couple in the same position as Prince Charles and Mrs Parker Bowles would be entitled to the same arrangements, according to the Church's guidelines.